It’s All About the Brakes! Just imagine a car or truck with no brakes, it would be impossible to drive safely as there would be no way to slow down or stop when you wanted or needed to so this makes the braking system a very important part of any vehicle. Most vehicles today have braking systems that place heavy reliance on the brake pads (A). Brake pads contain friction material and are configured to fit into a brake caliper. When you press the brake pedal, the brake pad is forced against the brake rotor, bringing the vehicle to a stop. This action creates heat and possibly noise. Worn or under-designed brake pads should be replaced to assure quiet, effective stopping power. 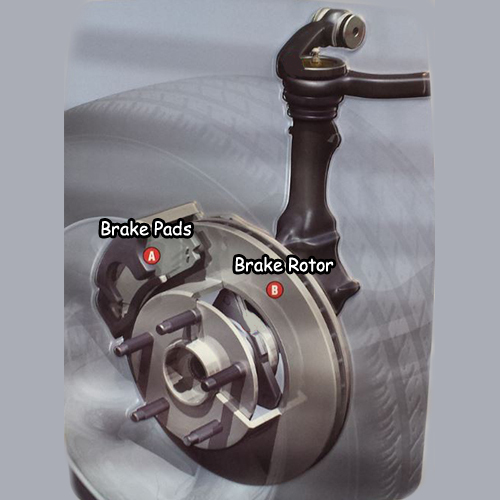 The brake rotor (B), provides the solid surface for the brake pad when stopping. Brake rotors will wear from repeated braking over time. Brake rotors may warp or crack from overheating. Today, worn rotors may require replacement rather than being “turned” or machined. Precision engineered rotors, along with quality break pads, are vital for safe quiet stopping. Some vehicles have brake shoes and brake drums on the rear axle which perform a similar braking function. Most vehicles today have ABS braking systems (Anti-Lock Braking), which help eliminate skidding from locking up the wheels. The brake system should be routinely inspected every 12 months/12,000 miles. It is important to have your brakes inspected on a regular basis to ensure they are functioning properly. Often, if a problem is caught early, the fix will be much less than if you wait until more damage is done. AAMCO of Bonita Springs is a NAPA Auto and Truck Service Center and offers repair and maintenance services for all vehicles including brake systems. Why Is My Car’s Air Conditioning Not Blowing Cold Air?